TOKYO, Aug 29 (Reuters) – Japan will not lower its guard over its whaling even though its biggest foe – the Sea Shepherd conservation group – has said it will not send ships to disrupt its fleet this year, a government official said on Tuesday. Paul Watson, founder of the Sea Shepherd Conservation Society, said in a statement on Monday the group’s limited resources made it difficult to compete with the military technology Japan employs to guard its whaling fleet and it would not send ships to the Southern Ocean this year. But an official at Japan’s Fisheries Agency was skeptical. “It’s not clear what the real intention of their statement is and we don’t know whether the organization will stop its anti-whaling actions this year,” the official, who declined to be identified, told Reuters. Japan defies international protests to carry out what it calls scientific research whaling, having repeatedly said its ultimate goal is to whale commercially again. In the 2016-2017 season, its fleet took 333 minke whales in the Antarctic. “We can’t deny the possibility that other anti-whaling groups may take action, so we continue to closely monitor the situation and we’re not making any predictions,” the Japanese official said. Watson said his group had discovered Japan was employing military surveillance to monitor their movements by satellite and Japan’s whaling vessels could easily avoid them. “The Japanese whalers not only have all the resources and subsides their government can provide, they also have the powerful political backing of a major economic super-power,” Watson said. His group had to decide whether to spend limited resource on another campaign in the Southern Ocean with little chance of success or “regroup with different strategies and tactics?,” he said. “We will not be sending ships to the Southern Ocean this year, but are not abandoning the Southern Ocean Whale Sanctuary. 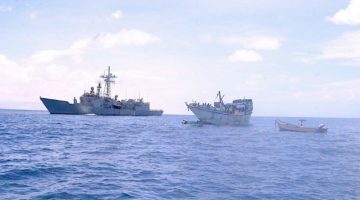 We need to cultivate the resources, the tactics and the ability to significantly shut down the illegal whaling operations of the Japanese whaling fleet,” he said.